I have 6 plates that are Marked on the back "woods Ivory ware" england with the crown in the middle and each has a stamped number W438 on each, pictures of birds on each with a painted gold around the scalloped edge...came from my grandmother here in the U.S. in her estate...I was just wondering what they were and if they are worth anything? Thanks for the interesting valuation request. 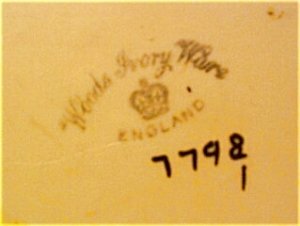 The Company of Wood & Sons Ltd which made "Woods Ivory Ware" is not to be confused with the over 30 other factories all of the name 'Wood' OR 'Woods'. There are several different companies just named 'Wood & Sons'! Your factory was based at the Trent & New Wharf Potteries, Burslem, Staffordshire, England. "Woods Ivory Ware" was made from 1930 onwards - mainly in the 1930's and 40's. Normally, "Woods Ivory Ware" plates fetch £2 - £3 GBS ($3 - $5 USD) each. Please note, though, I am not a china expert by any means, just an artisan within the industry, so the first thing to say is I NEVER do valuations myself. This is a specialist area with vast amounts of knowledge and research material required. My unique identification & valuation help will allow you to see if the mark is identifiable by experts without you having to pay any money upfront. This service is unique online and is designed to protect my site visitors from wasting their time and money online. I have just purchased a 6 piece set of teacups, saucers and plates from a charity shop for £15, the mark 'woods ware' is on an urn in the back of the plates and bottom of cups, and round the edge of the urn it says 'Enoch 1784' and the other side it says 'Ralph 1750' I know these are not the dates they are produced from. From what I have looked up it seems to be original the only thing I dont know about it is above the urn it says 'Osborne' and I havent been able to find any information about this particular design anywhere or what its worth. so any help or information would be greatly appreciated. Often people ask me for valuations and really, I am not qualified to do that - you need expert training and much antiquarian experience to do that job. However, what I have done is write a page especially to help visitors get an idea of the worth of their wares and also, if they feel the need a safe place to contact reliable and bona fide professional appraiser - checked out by me personally. I have a charming little tea set that includes a teapot, 5 dainty tea cups, and a sugar bowl and creamer. It is signed "Woods Ivory Ware" and ENGLAND, with a crown. It is clearly hand-painted and a few of the pieces have small black marks on them, as if the painter fell asleep for a moment. But it's a pretty set, perfect for display. I have had it displayed in my home for about 30 years. I can't seem to find anything like it, or for that matter, any information about it. like a blobby D or maybe a lyre. Wondered about what year this might be made to tie it in with a family member. I have a 12 place setting of Woods Ivory Ware, England but no pattern name or numbers on them. They do however have a variety of letters on them. I could attach a picture of the pattetn, but don't see an option to do it. How can I get more info on these, my grandmother's dishes?